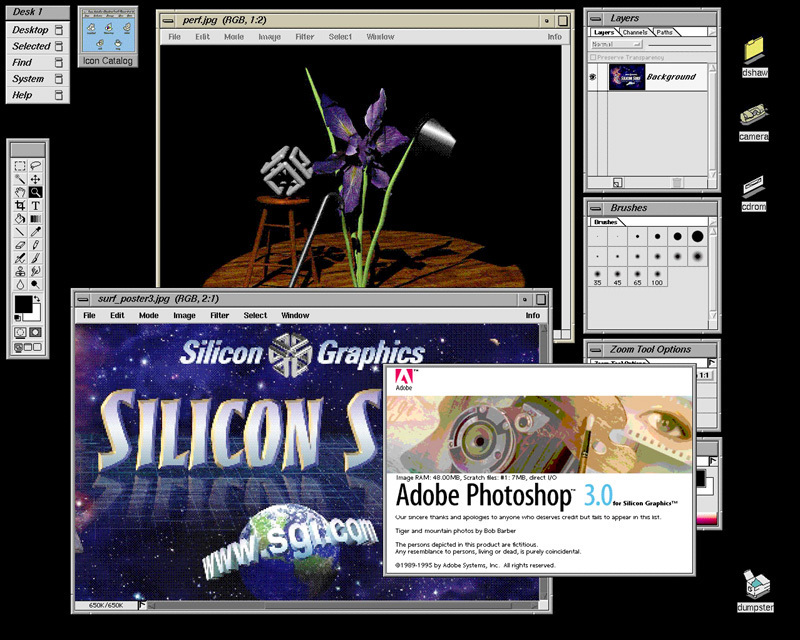 Following the incredible success of the IRIS Indigo series, Silicon Graphics came back with another hit, the Indy workstation. The Indy series came with processors ranging from the R4000PC/100MHz to either the R4400SC/200MHz or R5000SC/180MHz. The base line graphics is called 8-bit, but this is very misleading. By using a hardware dither, and 8-bit Indy can display something that looks more like 16-bit color (though there is a performance hit because of it). My Indy is named Gauss (after Fredric Gauss, and a Silicon Graphics Reality Engine at the National Science Foundations Geometry Center). It originally came with R4600SC/133 MHz with a 512k cache, but I upgraded it to an R4400SC/175 MHz with a 1 MB cache. It also has 128 MB of RAM, a 9.2 GB hard drive, 8-bit graphics card and a Radius 20" monitor. To give you and idea how fast it actually is (because MHz doesn't mean anything from one processor type to another), doing simple changes to a jpeg image in Gimp on my Indy was not that much slower that doing the same changes in Photoshop on my PowerMac 7100-G3/266 MHz, and playing mpegs at sizes larger than 640x480 it's better than the Pentium II/350 MHz Windows 98 computer (128 MB of Ram and a 9.2 GB hard drive) which I had in my office when I first got this system. 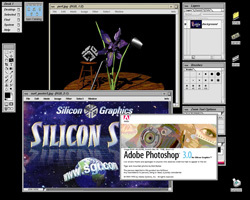 Gauss is currently running IRIX 6.2, which makes life easier because Silicon Graphics has a site where you can download shareware that they have precompiled for IRIX 6.2, including Gimp and AbiWord. 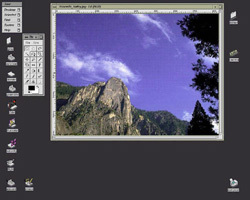 Other important software titles to have for basic computing would be Netscape Communicator 4.7 and Acrobat Reader 4.0. Gauss is mainly used for video capture. Currently I have both a VCR and DVD player connected to it... and basic cable for watching television on that system while working on other things. Networking with Gauss is done either via FTP or AppleTalk. 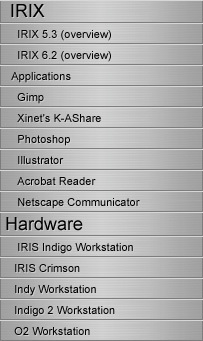 I have Xinet's K-AShare 10.0 installed to let my other systems see Gauss on the network. Indys come with a ton of ports. 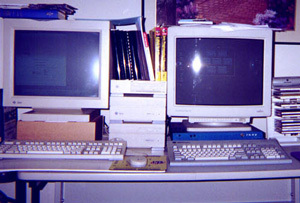 They were the first true multimedia computers. My Indy has both S-Video and RCA (composite PAL/NTSC) video-in connectors, and a connector for the IndyCam (a small video conferencing camera). It can also be expanded with a video (JPEG) compression card that lets the Indy capture and output video content at full frame running at 30 frames per second. On the audio side it has both analog and digital audio in and out. For networking it has both AUI and 10Base-T ethernet and an ISDN socket. For connecting to devices it has both a parallel and SCSI-2 connector and two Macintosh compatible serial connectors. The Indy came with three graphics options: 8-bit XL (like mine), 24-bit XL, and XZ graphics cards. The XZ option provides four hardware Geometry Engines that can provide 128 MFLOPS of processing power for 3D intensive applications (not needed if you have an R5000-series processor as it has more effective on processor rendering abilities). Shots of Gauss in action. In this image Gauss is sitting next to Archie (Short for Archimedes), a Sun SPARCclassic. Desktop shots of Gauss in action... this one is of me trying to get Quake running. 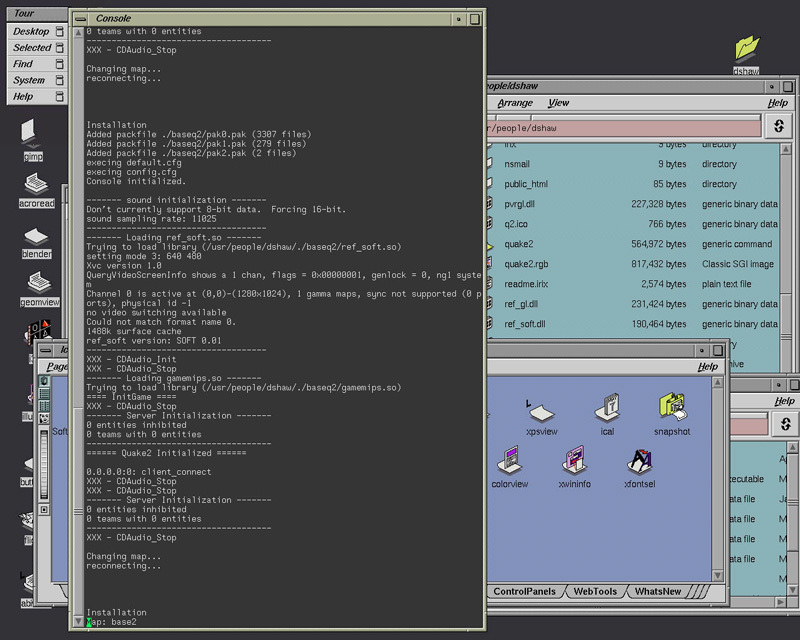 This is Gauss running GIMP. This is Gauss running Photoshop.